The absolute, number one way to overcome any stock market fears is to learn as much as possible about the market and the stocks you wish to purchase. As we here at MomVesting have always believed, knowledge is power. Becoming educated about the market can automatically make it feel less scary. Some great resources for learning about the market include the MomVesting investment definitions series, books "The Stock Market for Dummies" and "Understanding Stocks," and a trusted advisor at your local bank. Each of these sources can help you understand the stock market in simple terms, and from these basics, it's possible to research the stocks you may be interested in purchasing. Once you have a good knowledge basis, it may not feel intimidating to speak with an investment specialist about your options. But maybe it still will seem a little scary. Maybe you'll still feel ill-equipped. Rest assured, though, jumping into any new endeavor can be scary; it doesn't mean you're a total investment failure. You're simply getting your sea legs (or stock legs). When I decided to invest in the market beyond my 401(k), I was scared to death. Even though I had a good knowledge base and had researched my stock options, I feared the ultimate failure of picking the wrong stock, saying the wrong thing, losing all my pennies...really, I imagined the worst. What I realized, though, was that speaking to a real-live investment specialist helped me ease my fears. If you're like me and find the market a little terrifying on your first investment, you might benefit from sitting down with an advisor for a run-down on the basics. No one ever said you have to invest tens of thousands of dollars on your first foray into the stock market, so if you're a little nervous about investing, easing your way in may help alleviate some fears. Say you invest a few hundred dollars the first time around, just to get your feet wet. Or invest in safer stock bets, like long-standing companies that have historically returned well and/or pay out dividends. Whatever your choice, going with a stock that helps you invest with relatively little risk can help you get over the nervous butterfly feeling that often accompanies any first stock investment. 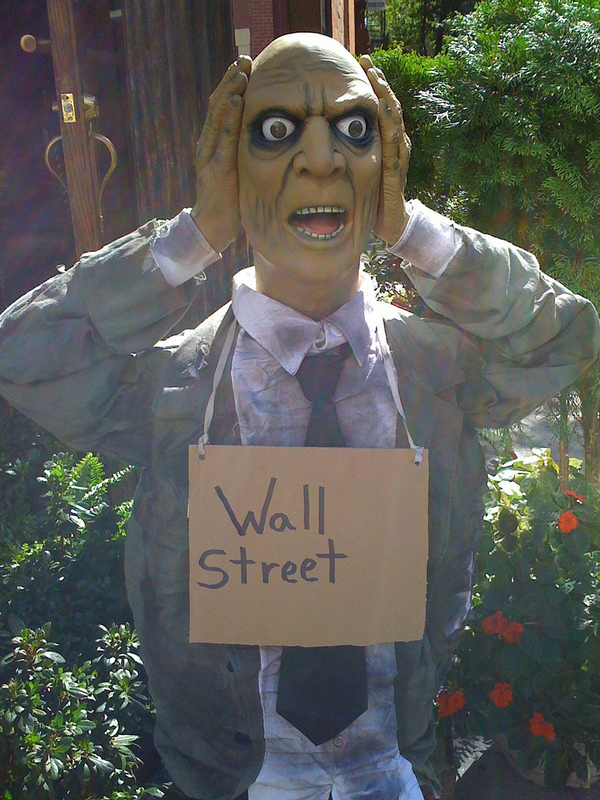 The stock market doesn't have to be scary. With a little knowledge, research, guidance and safe investments, you too can find the market a little less scary and more fun. Great post. I like your point about playing it safe. No one needs to go and risk everything and I think people feel like this is what they need to do. You can be conservative and still get ahead. This is where index investing wins. It is so easy and low risk. Very true, Miss T -- there are some great low-risk investment options out there. Thanks for the link, Leigh!